The true story of Winking Willys Fish ‘n’ Chips, regarded mistakenly in media circles as the ‘Bad Boy’ for our health, Fish ‘n’ Chips are the most fantastic source of natural produce, a nutritional meal, great value for money and an excellent protein provider, furthermore, they “Taste Amazing”. 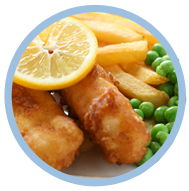 A portion of Fish ‘n’ Chips provides the body with Carbohydrates, Vitamins B6 and B12, Vitamin C, Iron, Calcium, Phosphorous, as well as trace elements of Iodine, Fluorine, Zinc and importantly Dietary Fibre. 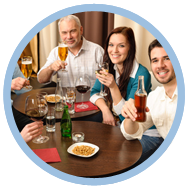 All of which are regularly stated as the staples of healthy eating in the world of food and diets. Food on its own won't make you fat, it is the amount of food that one eats, in relation to the energy that we as individuals expend. Fish ‘n’ Chips; if eaten in moderation as part of a balanced diet is a wholesome nutritious meal which contains essential vitamins and far fewer additives, including salts than other takeaway foods such as Pizza, Burgers’ American Style Chicken, Donna Kebabs and Curries. Fish ‘n’ Chips is one of the least adulterated foods that we can eat; locally caught fresh and frozen high quality white fish, freshly harvested Maris Piper peeled and chipped potatoes, some flour a little water for the batter, pure traceable Irish Beef Dripping for the cooking medium, nothing more nothing less. “Plain and Simple” .No other takeaway foods can ever boost that ! 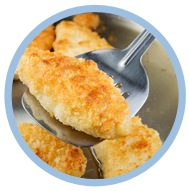 Our “State of the Art” Frying Ranges which we use in our kitchens today make for very quick frying methods and the high constant quality of the purified Fats used by us mean that very little fat if any, gets into the actual fish. For many, many, years Fish Fryers along the East Coast have been aware of fat penetration and have traditionally know of the health benefits of leaving the “Skin On” the fillets to help reduce the intake of fats they also did this so customers are able to identify the fish they are eating, this traditional practice is still undertaken by us at Winking Willy’s. 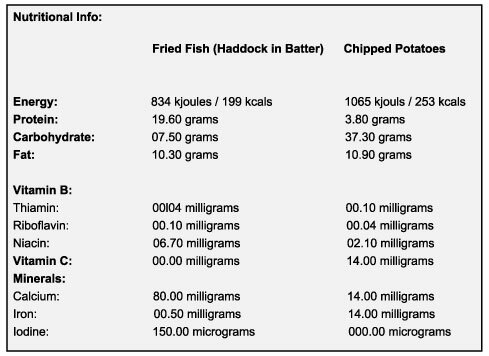 The total fat content of an average portion of fish and chips is estimated to be 48.2g. This compares favorably with say a cheese and ham sandwich with mayonnaise which has 51.98g fat or a Donner Kebab in Pitta Bread with salad and chips, which has a total fat content of 57.74g. The calorie count of an average portion of Fish ‘n’ Chips is in the region of 861 calories according to the British Nutrition Foundation, therefore if eaten as part of a balanced and controlled diet, you can continue to come and see us at Winking Willys and enjoy your Fish ‘n’ Chips on a regular basis. As For The Salt & Vinegar “You Are In Control” ! Analysis undertaken by the Seafish Industry Authority shows that a standard portion of fish and chips contains LESS Fat and LESS Calories than other take away food.